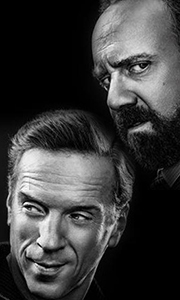 Paul Giamatti and Damian Lewis star in a complex drama about politics in the world of New York high finance. Shrewd, savvy U.S. Attorney Chuck Rhoades (Giamatti) and the brilliant, ambitious hedge fund king Bobby "Axe" Axelrod (Lewis) are on an explosive collision course, with each using all of his considerable smarts, power and influence to outmanoeuvre the other. The stakes are in the billions in this timely, provocative series.Sp..
Own Billions Season 2 DVD from Deff, DVD, Blu-Ray & 4K Video Specialists - Free UK Delivery..
Own Billions Season 3 DVD from Deff, DVD, Blu-Ray & 4K Video Specialists - Free UK Delivery..